When actress Alyssa Milano asked women to share their stories of sexual harassment and assault on Twitter last October, over 1.2 million tweets featuring the hashtag #MeToo were shared within 24 hours. Everyone from actresses to athletes to everyday social media users took to the internet to speak out about their experience with sexual violence. In the months since Milano’s first tweet, what began as an awareness campaign — which was originally started by activist Tarana Burke in 2009 — has become one of the most powerful “trends” in social media history. In the past, critics have been quick to write similar hashtag movements off as ineffective forms of “vanity activism,” but the #MeToo movement has proven itself to be something different, something more powerful. Not only has #MeToo dominated Twitter, Facebook, and Instagram, but the conversation has spread to mainstream media, to Hollywood’s red carpet, even to family kitchen tables across America. Thanks to the chorus of brave survivors’ voices, the #MeToo movement isn’t just trending online: new data shows #MeToo is making a difference in the lives and futures of young people. 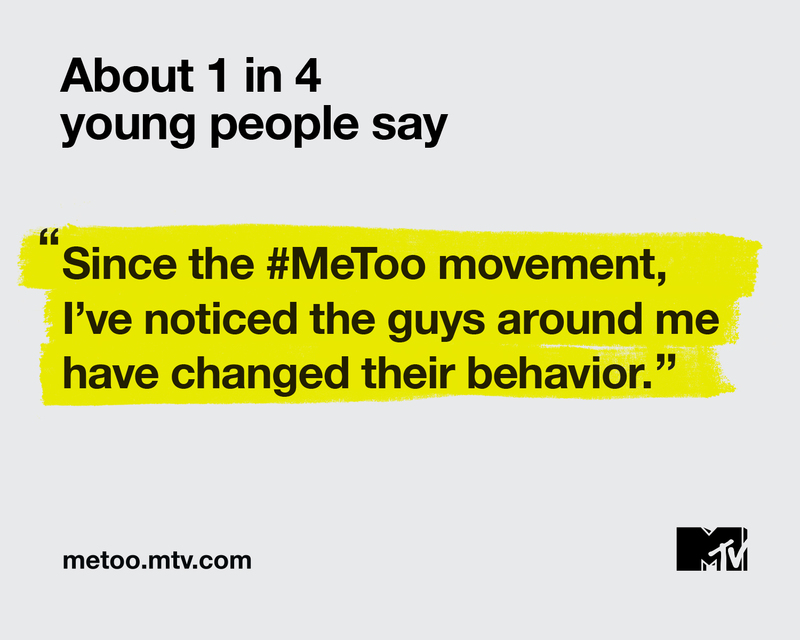 While conducting research on the effectiveness of the #MeToo movement and its ability to inspire change, MTV Insight Research found that not only is the #MeToo movement reaching young people, it is changing their interactions, influencing their dating decisions, and reshaping the way they think about gender dynamics. In a national survey of approximately 1,800 men and women between the ages of 18-25, researchers found that the majority of young people think the current flood of stories from those who have experienced sexual harassment is a positive development. They also believe that the #MeToo movement has sparked an important conversation, one that many of them are actively taking part in. According to the survey (conducted in December 2017), over a third of young people have shared social media posts in support of the movement — but their involvement goes beyond their online interactions and into their real day-to-day lives. In the wake of #MeToo, young men are starting to seriously think about their past behavior. Nearly 1 in 3 survey participants admitted that they were concerned that something they had done could have been perceived as sexual assault. This chilling finding points to one of the major problems at the root of the sexual assault and harassment issue plaguing America: men are not aware of which behaviors are appropriate and which ones are not. Luckily, the #MeToo movement is providing them with some clarity by serving up story after story of unacceptable conduct. Young men aren’t only examining their past behaviors — they are thinking about how to improve their behavior in the future. Young people are becoming aware of the prevalence of sexual violence and understanding how problematic American dating norms actually are. So now, they are actively working to amend them. Nearly half of the men in MTV’s study reported that dialogue around the #MeToo movement has changed how they interact in potential romantic relationships. It appears that, at the core of that change, is a new understanding of sexism, misogyny, and the gender-specific challenges women face every day. 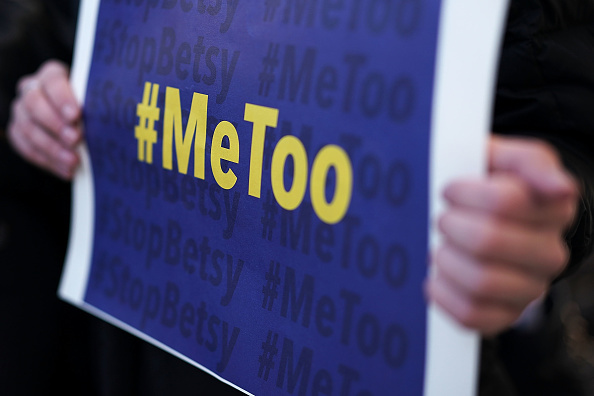 Nearly two-thirds of the study’s participants said that the conversations inspired by #MeToo have made them consider the ways in which society enables dangerous sexist behaviors. For their part, over half of the young men who responded even admitted that #MeToo has forced them to confront their male privilege and the many ways in which the world is different for women. It would appear that the dangerous sexual status quo perpetuated by men and forced upon women for far too long is finally being dismantled, and at the helm of the reconstruction are young people. Tarana Burke, the woman who started the Me Too movement years before trending hashtags were a thing, agreed that the study showed positive change. If this recent research is any indication, young people are certainly engaging. According to its findings, over half of participants reported that they were having more conversations about sexual assault and harassment as a result of the #MeToo movement. Everyday, discussions around sexual violence, its prevalence, and its consequences are becoming less taboo as more and more young people are willing to address the topic with peers, coworkers, family members, and even their legislators. Still, they are struggling to understand such complicated, sensitive, and deeply personal subjects. Nearly 7 in 10 young people said they wanted it to be easier to understand what is and isn’t sexual harassment. This points to another major problem at the crux of this major issue: ineffective and incomplete sexual education programs for young people. If we want American adults to understand what is and isn’t okay when it comes to potential romantic interactions, then we need to start teaching them right from wrong at a younger age. Luckily, the #MeToo movement is doing just that. If MTV’s new research is any indication, the #MeToo movement has already made some serious progress in the fight against sexual harassment and assault. It has also shown us where we need to focus our attention: America’s young people. We might not be able to go back in time and change centuries of sexism, misogyny, and violent gender disparity. But, armed with the right information and adequate resources, we can change the future for generations of young people to come. Learn more about MTV’s study here.